The next-gen version of the Samsung Focus, the Samsung Focus S, made its unofficial debut this weekend at a Microsoft event. 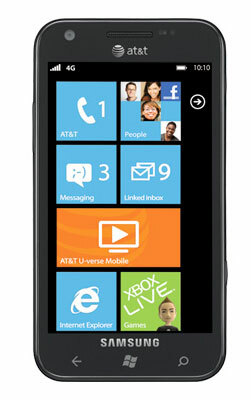 The 4.3-inch Windows Phone 7 boasts two cameras (including an 8-megapixel rear-facing camera) and will run Mango. While the Samsung Focus S is likely to be a popular new offering for the WP7 brand, the phone will not include a microSD card slot and will run a single core 1.4GHz processor. Its outer hardware (including its extremely thin body) is supposed to be fairly reminiscent of the Galaxy S2, which is quickly shaping up to be a serious iPhone contender. The phone hits a couple of firsts for AT&T: It’s the network’s first 7.5 Mango device as well as its first 4G phone. The Samsung Focus S hits stores November 6. Can’t wait? Check out the video below for an early look, courtesy of Windows Phone Daily.